When I was younger, I said that I didn’t want to die until my grandchildren graduated from high school. Of course when I said that I didn’t know that I would have 9 grandchildren and 4 great-grandchildren. Then, after so many of them graduated, I had to modify my statement to say that I didn’t want to die until my grandchildren graduated from college. Now I find that I have to modify that statement again, because the twins – Landon and Logan – have filed for graduation from Cal St. Fullerton; Cody, my second grandson is a Junior at ASU, and the others are quickly catching up to them. So my latest “death wish” is that I do not die until I see Colin, my 14 year old grandson do two things: Win a wrestling scholarship to attend Stanford; and win a medal at Nationals. I also want to be at his graduation from Stanford. I figure he can achieve those goals in 10 years, and at 84 I could still have a positive life, be reasonably healthy, and continue my quest to find a companion. (I seriously considered making my statement to include my youngest great-grandson – Noah – but he is only 2 ½ and I just can’t come up with a goal for him yet. But by the time he would meet whatever goal was set out for him, in twenty-three years at 97 I don’t think I would give a damn.) So let’s talk about wrestling and Colin. As a little girl – a long time ago – I remember sitting in front of the old black and white television with my grandfather watching Gorgeous George wrestle. He was a handsome man – George, not my grandfather – and he always pinned his blond hair back with gold bobby pins. I wrote to him so many times that I, too, pinned back my blond hair with bobby pins engraved with “Gorgeous George’s” name on them. As I got older, I tried to tell my Grandfather that we were watching a show, but he would never accept that. He insisted that the matches were not rigged; they were honest and every now and then he would point out that the Gorgeous one lost. When I was told that Colin was going out for the wrestling team I was appalled. I had visions of him being tossed out of the ring on his back; his body bent into unnatural shapes; broken bones; cauliflower ears, etc. For the first year that he wrestled I found excuse after excuse not to attend any match. But a grandmother can only come up with so many excuses, and the fact that he was wrestling at a venue nearby–a place that was easy to get to and at a time that was convenient for me–I had to bite the bullet and attend my first honest wrestling match. 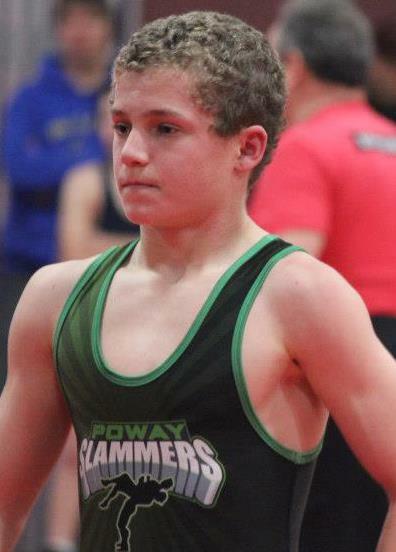 It is hard to realize that this 12 year old boy had already decided that wrestling would be his entrée into college, and at Stanford University at that. He is an A+ student; excels in math and science and probably could win a scholarship on his academic merit alone. 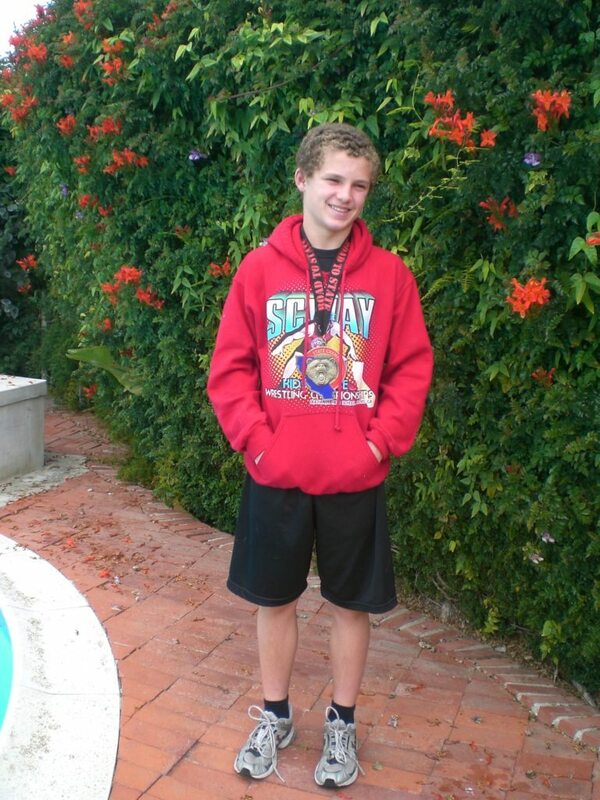 It is difficult for me to believe that the scrawny 12 year old is now this buff 14 year old. He has competed in many tournaments and has won and lost his fair share of matches. A few weeks ago he competed in a competition that would pick the best wrestlers from our area to compete in the State finals, held in Fresno over the weekend of March 23-24. Colin wrestled in the 110-115 pound category and came in 8th in his class. He won a medal that is so heavy you would almost have to be a wrestler to wear it around your neck. And he is now eligible for the National finals. Come August of this year, he will enter High School and become a part of the wrestling team at Kearny High School. I asked Colin to write a few paragraphs about his decision to become a wrestler and I’d like to share those reasons with you. I like wrestling for its individualism. I mean that in two different ways. There is no other sport like wrestling. There is no other sport that can weed out the half effort kids so well and so quickly. If you don’t like wrestling you won’t be successful and if you’re not successful you won’t like wrestling. I also love wrestling because it’s an individual sport. I played football and while I was one of the better players on my team, I was dragged down by the weaker links on my team. In wrestling there’s none of that. You can’t be carried into the end zone and you don’t have to be the one carrying your team. While your team may practice as a team, you step on the mat as an individual and I love that. I currently wrestle for Poway. 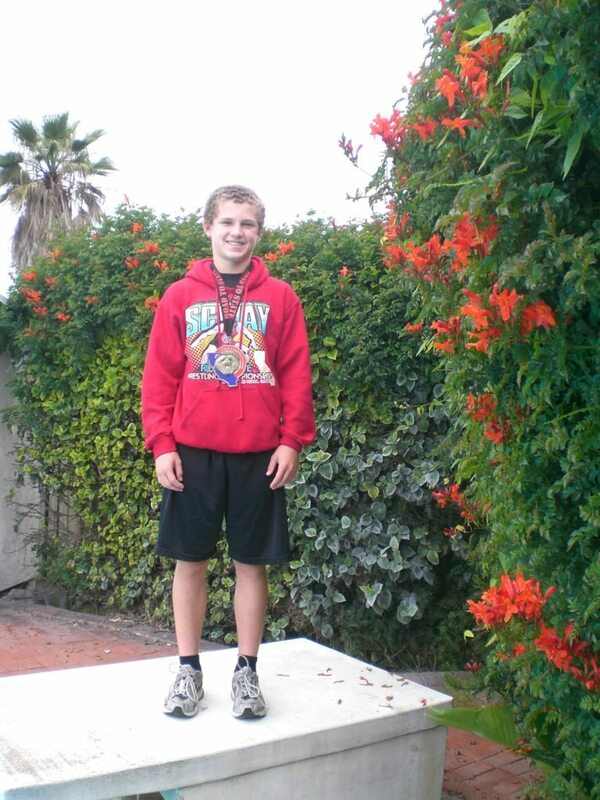 I started this year wrestling for Mira Mesa but mid way through the year I switched to Poway. Mira Mesa is a great club; they welcomed me with open arms and got me to love wrestling. Sadly there was nobody at Mira Mesa who was my size leaving me no choice but to switch to Poway. At Poway there are 3 other boys about my skill level and weight and we all pushed each other to get better. I have lots of plans for wrestling. Next year I plan on wrestling for Kearny High and I hope to make the Varsity team. I plan on winning a state title before I graduate. I plan on going to Stanford University on a wrestling scholarship. While at Stanford, I plan on winning a national title. Lastly, after I graduate I plan on winning the world championships and being wrapped in an American flag. As I mentioned last week, I am proud to report that my son placed 8th in State and therefore is eligible to compete in Nationals. That is a huge accomplishment for him but I especially wanted to honor, acknowledge, and share the commitment it took for him to reach his goal. Last summer he decided that he wanted to place at State this year, which is a pretty lofty goal considering he just completed his first season of wrestling, and was two and out at State last year. Escondido HS had an open mat every Saturday during the summer so he got up early and went there and learned and practiced various moves with different wrestlers. My son loves surf camps but last summer he chose to forgo those and went to a wrestling camp in Arizona and a wrestling camp here in San Diego. Probably the hardest decision that he made was that he switched clubs so he could practice with another club that had 3 boys that were better than him. The club that he left was/is amazing. They were so welcoming, supportive, and treated us like a family. The coaches are amazing! At the new club, the 4 boys were so competitive and pushed, competed, and fought each other to become much better athletes and wrestlers. Colin practiced 3 days a week, including Fridays so missed countless sleepovers, hangouts, and school functions. He had to watch his weight so he missed out on lots of school parties, where well meaning friends thought it was funny to taunt him by holding cupcakes under his nose. Needless to say, Colin didn’t see the humor in it! He’d go with friends to In ‘n Out burger and not order food, which I find impressive at any age, let alone at 13 or 14! But in the end, all the sacrifices really turned out well and were worth it when he beat a teammate that he has never beaten before to medal 8th at State games. Congratulations Colin! I love you and am so proud of you! Not only am I proud of Colin, but I am also very proud of Stephanie and Barry, Colin and Molly’s parents. There was no way for Colin to get to Escondido every Saturday unless one of them took him. They realized he had a goal and made sure that nothing stood in his way of reaching that goal. As one of them was driving Colin to practice, the other parent was driving Molly to rugby. These two parents are wonderful models for their children, and for the friends of their children. And, more importantly, at least from a selfish point of view, I think that my goal of sticking around until Colin gets his scholarship to Stanford; wins a national title; and graduates from college will be achieved. Look for me sitting in the audience in May of 2024 – with a huge smile on my face. Go Colin! I wrestled in high school and college, won a lot of metals, and over the long run it was one of the best experiences I’ve had in life. At my advanced age I carry some of those lessons still. How to mange my diet. How to stretch and exercise to stay fit and trim. But most of all the intense, intense focused problem solving process’s that a good trained wrestler experiences in a match has been the bed rock of my professional career. It is logical,s sequential, disciplined, provides clear rewards and punishments , all vital skills in a profession. I used it for degrees in philosophy and a number of other wrestlers I know did as well. Or math. So good luck to the kid and whether he gets a flag drape or not (since they are discontinuing wrestling as an Olympic sport) he will grow and prosper. Yea you ought stick around for those matches!!!! And while we’re talking about self-disclosure, who knew my old friend JB was a wrestler as a kid and drew important life-lessons from that experience? This was fun to learn and lovely of him to share, thinking of Judi Curry’s striving grandson Colin. The only wrestler I know (and only by proxy) is the novelist John Irving who wrote “The World According to Garp,” and “Ciderhouse Rules” — both of which display remarkable empathy for children and young people. So too with the revelations of Widder Curri and Jim Bliesner. I loved this piece, Judi, about your ever-expanding view of life expectancy based on your fascination with and appreciation for your children and their remarkable offspring. You are so publicly kind and affectionate — I’m sure each of them will print out this online essay and keep it close always. (Much much more touching for me than the gritty stories on boyfriend-searches.) Thank you. Thanks, Fran. It is amazing the path that life takes, even when expected. I marvel at my grandkids and the things they have already accomplished at early ages; their goals and objectives wherein I am still trying to establish my one. Today is my 47th wedding anniversary – without my husband for he past 3 1/2 years. Very difficult yet to go back and visit that wonderful day so many years ago. The hopes and goals of my family keeps me going. And the greatest thing about it all is that they have no idea the impact they are making on me. Shalom! And amazing the resilience of human beings who suffer loss! Adult children and their kids are fortunately too busy to really take in how much they mean to their surviving mothers, fathers, grannies and grandads who have time to reflect on life and time passing. As a big crier, I think that’s probably just as well. Everyone would just be overcome with boo-hooing from excruciating love and overwhelming mutual gratitude. Your story here is the perfect expression — celebrating the moment. How true that is, Fran. We lost a grandchild when she was 13 months old. The initial thought was that she died from SIDS, but in retrospect, we believe that her care giver – a multiple personality – killed her. We still long for her; celebrate her birthday; the day she died; and the holidays just a few days before she was taken from us. And that was over 25 years ago!) I now take nothing for granted any more. I will do all I can for my grandchildren to achieve their goals – we don’t know when something alters those objectives. Thank you for celebrating with my family and I.
Judi, you love life so much- the possibilities, the surprises, the sensual pleasures, the challenges, and the oddities. That always shine through as you go forth with curiosity, good will, a keen intellect, a loving heart and a wonderful sense of humor. You and life dance together. I’m reading and watching and taking notes. I guess that’s my goal too – to stick around until my 4 year old grandson grows up. My two granddaughters are well on their way at 12 and 9, but my grandson has a longer row to hoe. He’s a great little guy, but on the verge of being kicked out of preschool. His parents have now persuaded him to say “What the frick” instead of “What the ****.” He’s got a lot of energy and I fear the school system will want to put him on Ritalin. He’s 4 going on 14. He can talk any adult at the zoo into letting him take pictures with their fancy cameras. And at the park he can sniff out anyone with lunchables and join them in the party. He calls me “Baboom” a name he made up. Nobody knows where it came from. I’m lucky that I have been able to be involved in my grandkids’ lives on a daily basis. Monday I take Monique for her piano lesson. Thursday I pick up Isaiah from preschool and we go to the park or the zoo, play trains or go swimming at the Y. The two girls are on my T-Mobile family plan, and today I have to try and locate a used cell phone on Craig’s list – to replace the one Monique lost – for her 10th birthday, April 28. I’ll make a deal with you John. I’ll stay around to watch Colin reach his goal, with the caveat that I might have to modify the grandchild that keeps me here as Noah – age 2 1/2 – grows into his goals if you stay around until Isiah reaches his top potential. Deal? John Lawrence, it sounds like the four-year-old grandApple does not fall far from the Tree. I think it’s lovely that Noah gets to be with you on Thursdays — days neither of you will ever forget. Help him shape up: some of pre-school can be fun. And granddaughters who are not yet teenagers! I hope you are very spoiled and spoil them in return. Tell ’em (almost) everything you know. It is interesting to me that Judi’s revelations have released this stream of heartfelt consciousness and common bonds among some of the mad-as-hell libs of the SDFP. Beautiful. Thank you again. Thanks, Frances. I took Isaiah to the Reuben H Fleet Museum last week to see the movie, The Rocky Mountain Express. Afterwards he had a great time playing with kids at Kid City. He made friends and continued later to do all the science experiments with one of them. I could hardly get him out of there. Another wonderful article, Judi, and very touching along with the many great comments. You are a role model! Thanks, Nancy. I try to write from my heart – and those responding only give me more encouragement to continue in the same vein. You are pretty neat too!